Frequent crashes and easy cheese strategies make Gratuitous Space Battles 2 a superfluous sequel. Remember to click save a lot, or you'll end up losing a lot of meticulously laid-out space-formations. That's the first bit of advice, of a few, I'm going to offer you for Gratuitous Space Battles 2. And like most of this advice, it's not for a positive reason. This multi-save diktat, for example, is thanks to GSB2's proclivity for crashing when loading a battle, finishing a battle, moving between menus, exiting to another window and entering from another window. Based on some of the Steam user reviews, it would appear I’m not alone. Fortunately it doesn't happen with every mouse click, just more than it should. 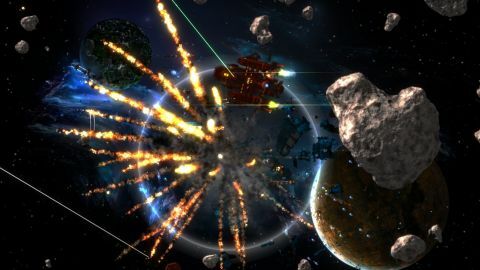 When it's not busy throwing you out to desktop, Gratuitous Space Battles 2 offers up a second slice of Positech's take on real-time strategy. You choose your lineup of ships, from huge dreadnoughts to one-person fighters, set their tactics and orders, place everyone how you want them and set them loose, and watch the battle unfold. If you haven't played the first GSB, it will take a few battles before you're really used to the hands-off nature of combat. It can be endlessly frustrating to see your ship persist in targeting the wrong enemy when, with a slight aiming adjustment, they would take out the most dangerous ship on the map. But soon enough you learn you can tweak to make that change—as in Gratuitous Space Battles 2 you live and die by the tactics you choose ahead of time. However, sometimes it would be nice if your fleet realised attacking a dreadnought that's being supported by four shield-replenishing gunships isn't as good a tactic as attacking the gunships themselves first to negate their buff. But what can you do? All the tactical planning in the world matters little when you realise that 90% of your encounters can be won by strapping a couple of tractor beams to a fleet of dreadnoughts, along with their usual array of lasers and missiles. Tell them to attack fighters and gunships—the ship types dreadnoughts are supposed to be weak against—as well as everyone else, set them in formation and win. These behemoths of the void aren't supposed to be magical win-boats, but in practice they very much are. There's a mission in the incredibly brief single-player campaign where tractor beams aren't allowed, which means fighters and gunships are a threat, but everywhere else it really is a case of 'send in 12 massive bastards and reap the glorious honour'. The honour system in Gratuitous Space Battles 2 is also flawed. The less you spend before going into battle, the more honour you maintain and thus earn if victorious. This can then be put toward unlocks—researching new weapons and modules for your ships, unlocking the other three races, accessing new hull designs and gaining access to ship design elements. It's nice to have these unlocks and it should be something to play towards for most players, but again we're met with a couple of problems. The first being that, with your dreadnought-rush demi-tactic in place, you earn a lot of honour quickly and so can buy most things after just a few missions. Second, most of the unlocks are pretty useless. The other races offer negligible differences in buffs to ship stats, and the selection of weapons and modules is so incredibly samey it often comes down to choosing between a laser/missile that shoots further or a laser/missile that does a bit more damage. Probably the best addition to Gratuitous Space Battles 2 is the custom ship designer. Just like before you're able to kit your fleet out with the weapons, shields, engines and other such space-trinkets you would expect in order to wage stellar warfare. But this time around you can actually customise what the spaceboats look like, with a robust, simple editing system. Nothing you do to your ships affects performance in any way—it's purely cosmetic—but there is some fun to be had tinkering with your best/worst/stupidest design ideas. The ability to share your creations with the world is a nice touch, too. In fact, community spirit is clearly of much importance to Positech. Modding is mostly carried out via text editors or Excel, and challenges—GSB2's multiplayer, effectively—can be opened up to the entire player base with a couple of clicks. So there is hope for Gratuitous Space Battles 2. If Positech fixes the regular crashes, that's step one. Step two, however, would either involve a huge change to the game's core mechanics, or would be down to a dedicated modding community—something that, while very much supported by the developer, isn't something anyone can guarantee either way. But for now, in the state GSB2 is in, it's a difficult game to recommend.